There are many ways to name things, especially, in the English Language. One way to name something and make the name stick, however, is to simply call it what it is and that is exactly what has happened with the mountain of butterflies. The mountain of butterflies as the name spells out is the wintering destination for millions of migrating monarchs. Monarchs which are also called monarch butterflies are milkweed butterflies in the subfamily Danainae and family Nymphalidae. They are the most known North American butterflies with wings that feature the easily recognizable colors of black, orange and white. Their wingspan is 8.9–10.2 cm ( 3 1⁄2–4 in). The mountain of butterflies was discovered a long time ago on January 9, 1975. When the Zoologist Fred Urquhart first saw it, he is said to have exclaimed “Unbelievable! 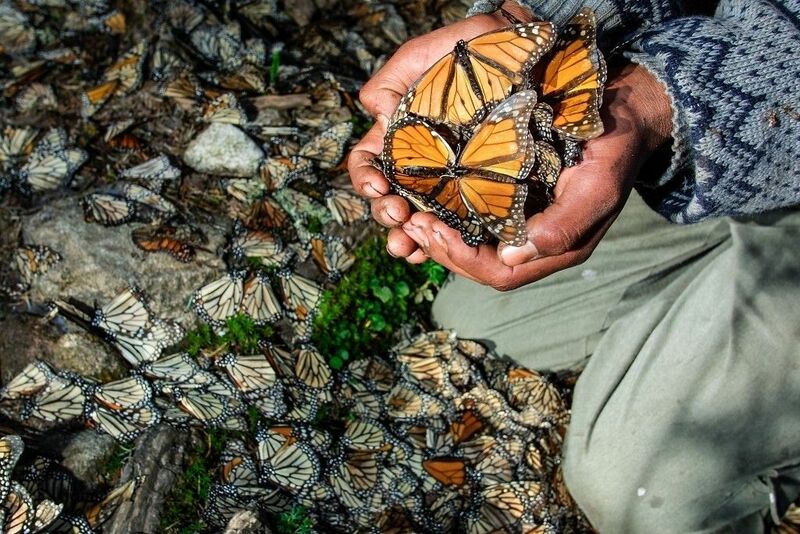 What a Glorious, Incredible Sight!” Urquhart was however not the one who solved what had at the time been a mystery about the migration of the monarch butterflies. Below we list the key facts you need to know about the discovery and the entire marvel surrounding the mountain of butterflies. The breakthrough in solving the mystery of the overwintering habitat of millions of monarch butterflies came about by citizen scientists Ken and Catalina Brugger. It had taken two years of searching with Canadian zoologist Dr. Urquat who was overjoyed at the discovery. While announcing it in the August 1976 National Geographic issue, Dr. Urquat wrote that he was amazed at the sight of the butterflies which were packed on every branch and trunk of oyamel trees. It was a great pay off for Dr. Urquat who together with his wife founded the Insect Migration Association, now known as Monarch Watch, to get thousands of volunteers across North America to tag butterflies in their hundreds of thousands so as to track their migration. The answer gotten in 1975 was millions of butterflies 10,000 feet above sea level on Cerro Pelon, situated on the border of the States of Mexico and Michoacan. We have already given a hint of the location of the mountain of butterflies but it is also helpful to note that the wintering destination for monarch butterflies is now protected as the Monarch Butterfly Biosphere Reserve. The property is located 60 miles northwest of Mexico City. It is at 10,000 feet above sea level and continues to serve as the home to most of the monarch butterfly population in North America between October and March. Even before its 1975 discovery, the mountain of butterflies had been a part of local culture for quite a while. On the day that the monarch butterflies arrived each year, there was simultaneously a Day of the Dead celebration which would begin on Halloween, October 31, then end on November 2. It featured in local legends in the areas around and after its fame grew upon discovery, Mexican President Jose Lopez Portillo designated it as a national part (five years after). In 2008, after it had gone through numerous classification changes, UNESCO eventually named it a World Heritage Site. Thye mountain of butterflies faces numerous threats despite best efforts by local and international authorities to protect it. By far one of its most dangerous threats, however, is the trash that is often left in the park by tourists. It may be one of the reasons why although eight colonies exist in the reserve, only two are open to the public. More threats come from logging, deforestation, and agitations by local farmers to use the land for unlicensed purposes. As fascinating as the congregation of monarch butterflies is, so is their departure. The millions of butterflies that fry south from states like Califonia settle in oyamel and pine trees. Their collective weight exerts pressure on the branches that make them sag while also making the brown wood to appear orange. When the weather warms up in spring, the butterflies take flight and do so collectively such that the locals liken the sound of all their flapping wings to that of light rain. In 2015, the U.S. Fish and Wildlife Service released a report stating that there had been a disappearance of 970 million monarchs since 1990. The 90 percent population decline was blamed partly on the rise of herbicides that destroy milkweed which are the plants that host the monarch butterfly eggs as well as provide food for the monarch caterpillar. They used the occasion of the report’s release to announce an initiative to “Save the Monarch”.